Chapat is an hindi word meaning slap and traditional way of making chapati is forming the dough into thin rounded bread is by slapping the dough between your palms. Naans might have taken over the chapatis in festivals and parties but chapati is still everyday need and consumed by over 1.5 billion people at least twice a day. When you start learning about cooking in India, Pakistan, Nepal and Bangladesh, first thing they will teach you how to make chapatis. Surprising part is that one of the most famous bread in the world and has the least written history, you will find some reference in Islamic history books mentioned two of the four caliphs eating chapati also there is some reference from mughal king Akbar in ain ul akbri and i would say thats about it. but i do believe there has to be some history in the Sanskrit to be discovered. Chapati is very simple to make and the skill you need how to make perfect rounded chapati and that just comes within two three times of makig them. If you like it please do use comment box below and do not forget to subscribe our site to get new recipes everyday, we don't just share the recipes from around the world, we dig the history for you to bring some of the best recipes for you and we bring the memories of ancient life into your kitchen. In a large bowl add flour, Slowly pour water into the flour, moving your other hand through the flour in circular motions, until it starts to come together, knead the dough for about 10 minutes or til its soft and smooth. Rub the surface of the dough with a little oil to keep it from drying out. Cover with clingfilm or a damp cloth and allow to rest about 30 minutes. 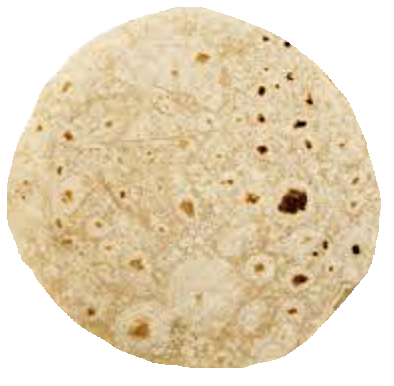 Make equal balls, flatten one lightly and drench it in flour on both sides, start rolling them with a light hand from inside out, your hand should be light enough and surface floured well for the chapati to roll on its own into a circle without you having to twist or turn but for beginners it might be easier to just pick it up every now and then. Heat flat skillet on medium flame and place chapati on it, after 15 seconds flip it to other side, let it cook for a minute rotating the chapati every few seconds to ensure all the sides get cooked evenly. Once you see there are brown spots on the under side, flip it over. 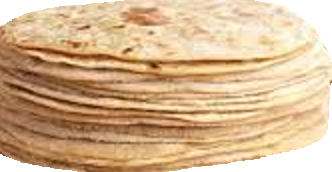 keep pressing with a dry towel the sides and you should notice the chapati filling with air, lightly press down with a dry towel on the areas filling up so as to encourage the air to pass through the entire chapati. Once the whole chapati puffs up take it off stove (you could also place the Chapati directly over the gas flame for quicker puffing). Serve hot with curries, pickles or use as a wrap.